The black mamba has many interesting adaptations that have allowed it to survive in the African wild for so long. They have a specialized organ known as the vomeronasal Organ, or the Jacobson’s Organ which is involved in the snake’s chemical communication and in hunting prey. The snake collects stimuli from the environment, such as air particles and other molecules with its forked tongue, and transports them back to vomeronasal ducts. The ducts open into grooves in the mouth which the tips of the tongue graze over, placing molecules from the environment into the vomeronasal organ ducts. The organ then processes the stimuli and helps the snake to detect what it is in the environment and where potential prey is. The Jacobson’s organ (learn more here) provides the snake with an advantage over its prey by enhancing its taste/smell sense. The black mamba is also a type of snake known as a proteroglyph. This means that the fangs of the black mamba are front fixed, and they can’t be folded up into the roof of the mouth while they aren’t in use. This also means that the fangs have to be kept relatively short so that they don’t puncture the lower jaw when the mouth is closed. The Black Mamba, along with many other elapids, has evolved a hood like structure around its neck that can flare out when threatened. The hood functions to make the mamba appear larger and scare off any potential threats. Learn more about another snake that has evolved a scare tactic here. One of the more amazing adaptations that the Black Mamba, and all snakes for that matter, have evolved is the ability to move without legs! They are the only taxonomic group of the chordates to use this type of locomotion. 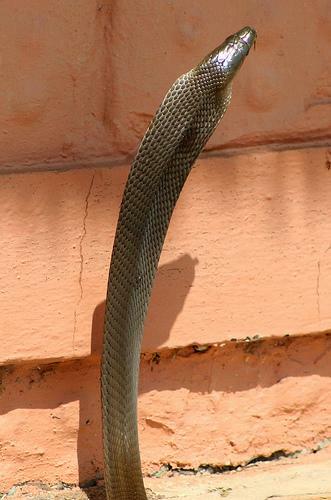 The black mamba moves its body in a sideways motion, pushing off of the substrate when its body is turning. These sideways movements propel the animal throughout their environment quite successfully. Another evolutionary trait that black mambas possess that has recently come to light that helps them move are their scales. A study done at the University of Georgia Tech has shown that the scales on snakes have evolved to act like hooks to create more friction to help drive the snake forward (to read more about this study click here). While they conducted the study, they wrapped a test snake in a cloth coat, they had a significantly tougher time in moving forward. This is strong evidence for the friction that the scales create. The black mamba also has evolved an amniotic egg, which means that it has an amnion membrane surrounding the embryo inside the leathery skin of the egg. The amnion cushions the embryo, while also preventing desiccation. 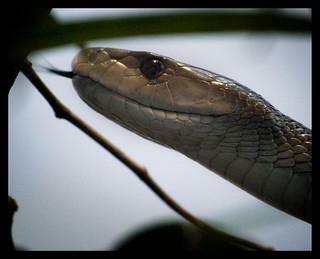 One of the most important adaptations for the black mamba, however, is its venom. It is extremely potent, and you can learn more about it on the venom page.